Leicester City will only be good enough to land a top-half finish in this season’s Premier League, with the Foxes failing to successfully defend their famous title. 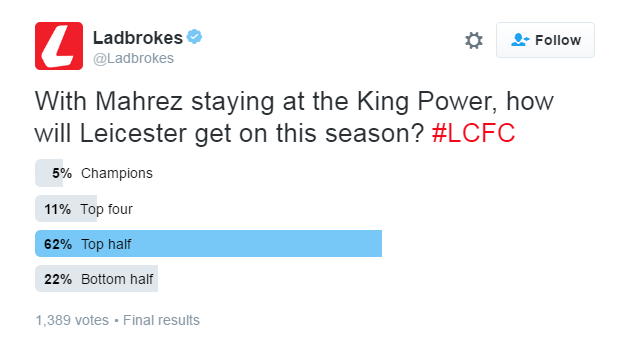 That’s the result from today’s Ladbrokes Twitter poll, which asked how Claudio Ranieri’s team will fare this term. Having sold N’Golo Kante to Chelsea, doubts were raised over the future of Leicester’s other stars, but it seems now that the likes of Riyad Mahrez and Jamie Vardy are staying put at the King Power Stadium. Even so, it doesn’t seem as though you think the east Midlands club will have enough to repeat last season’s 5000/1 heroics. A top-half finish was the favourite answer today with a whopping 62 per cent of the vote. Next up came a bottom half finish for the Foxes, with 22 per cent of today’s poll suggesting Ranieri and co will struggle to emulate last season’s heights. Some 11 per cent reckon Leicester can land another top four spot, with the bookies making them an 11/2 to finish in the leading quartet. That left just just four per cent to say the Foxes can do the incredible once again and win the league at 25/1. Leicester will kick-off the new season when they head to Premier League returnees Hull. The Foxes are 13/10 to get their campaign off victoriously, with Steve Bruce’s Hull 9/4 to cause an early dent in Ranieri’s aspirations.